The light we detect from the most distant galaxies has taken many billions of years to reach us. It was emitted at a much earlier epoch of galaxy formation than the one we see around us today - when the Universe itself was young and the galaxies we observe had only undergone one or two phases of star formation. These early galaxies are likely to have been the building blocks from which the more massive systems we see today formed. If we can understand them, then we can place constraints on the process of galaxy formation and evolution. New telescopes and instruments are opening new opportunities to study these systems - probing not only the stars in these galaxies, but also the dust those stars produce and the molecular gas that provides the fuel for star formation. New and improved galaxy stellar populations are essential for interpreting these observations. In particular, the effects of stellar multiplicity (i.e. interactions with binary or tertiary companions) can be significant for the young, intensely star forming and often low metallicity populations which are now being probed. The Binary Population and Spectral Synthesis (BPASS) project is an ongoing effort to develop improved stellar population models in a range of environments, including in the earliest stages of galaxy evolution. Recent research focuses have included old stellar populations, gravitational wave event rates and the stellar mass distribution in galaxies. 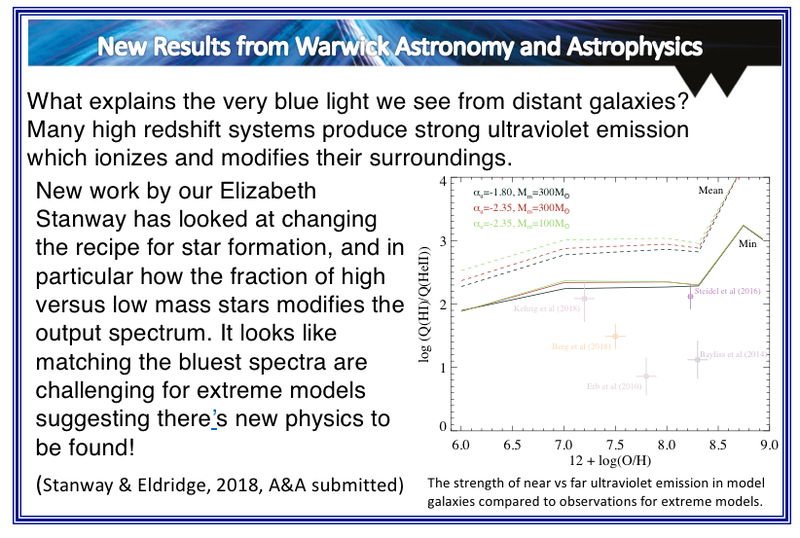 A PhD project in this area would contribute to the development of the next version of these widely used models and in particular focus on the effects of changes in stellar chemical abundances over time and their observable consequences. Please fill in our PhD enquiries form if you are interested in studying for a PhD in Astronomy at Warwick.